Rock and Roll and barbecues are two things many Midwesterners think of when they think of summer. Why not combine both things into one giant event and throw in some comedy? 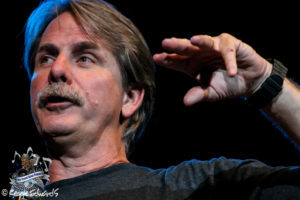 Legendary comedians Jeff Foxworthy and Larry The Cable Guy had the same question and brought the idea to life this year, with Jeff & Larry’s Backyard Barbecue- which, though a short tour run, recently hit Noblesville’s Klipsch Music Center. The comedy duo brought fellow comedian Nick Hoff along for the ride as well as iconic rock groups Foghat and Marshall Tucker Band for a night of family-friendly comedy and music and an experience so unique, you can only get it in one place- this tour. The night started early with local Indianapolis rock group, Decibel, who got the party started with a set loaded with covers that you’d have thought were being played by the original bands if you weren’t paying attention. Not long after they wrapped up, comedian Nick Hoff took over. Hoff was the emcee for the night so he had two sets- one to kick things off and then later in the night before Jeff Foxworthy took the stage. Hoff, though relatively new to the Indianapolis crowd, had two very successful sets- talking about the differences between husbands and wives and more, with almost every joke met with a roar of approval from the fans. While Foxworthy and Larry are longtime veterans of the comedy circuit, Hoff is much earlier into his career and is off to one hell of a start. Before too long, he should be one of the top comics in the country. Foghat was up next and played a short, sweet set- starting off with “Fool for the City” and launched quickly into a load of hits- including “Stone Blue,” I Just Want to Make Love to You” and “Slow Ride,” during which they were joined onstage by Larry The Cable Guy (who’s guitar skills were very impressive) and Jeff Foxworthy, proving right at the start that this wasn’t just a concert- this was a summertime party. 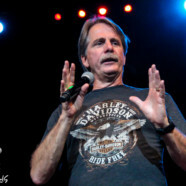 After another short set by Hoff, Jeff Foxworthy took the stage for a set that had everyone in attendance crying with laughter. His take on the differences between how men and women pack for vacation, how they relay message details, various “facts of life” (Wal Mart after dark makes The Walking Dead look like a Disney movie), his experience with a kidney stone- which many can relate to- and what promises he would make if he ever ran for President of the United States- was met with overwhelming applause, laughter and cheering. It was hard for Larry The Cable Guy to follow Foxworthy. If you love Larry’s comedy, you were blown away but if you weren’t a fan going in, there wasn’t a lot there to win you over. His set went over very well and was met with high approval from fans and his story of how he got the role of “Mater” in the Cars series was by far the highlight of the night. Closing the evening was a short, powerful set by Marshall Tucker Band, who only played a few songs but threw in everything fans could have possibly wanted. Joined on stage by Foxworthy and Larry (the latter of whom did an impressive job on the flute), the party was far from over and the entire crew made sure those in attendance went home satisfied. In the end, the show sold very well, fans got their money’s worth and all acts- whether comics or bands- delivered on every level. We can only hope the tour makes a return in 2018.